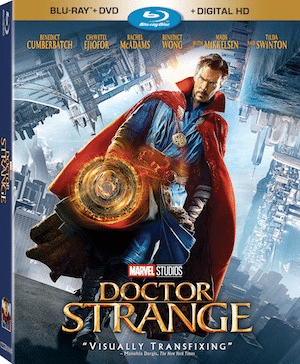 Doctor Strange comes to your home Blu-Ray, DVD, Digital HD | DaDa Rocks! From Marvel Studios comes Doctor Strange [amazon], the story of world-famous neurosurgeon Dr. Stephen Strange(Benedict Cumberbatch), whose life changes forever after a horrific car accident renders his hands useless. When traditional medicine fails him, he travels to the remote Kamar-Taj in search of a cure, but instead discovers the mystical arts and becomes a powerful sorcerer battling dark forces bent on destroying our reality. Bring Home The Mystifying, Mind-Bending Journey on Digital HD Feb. 14 and Blu-ray Feb. 28. The film boasts an award-winning cast, including Benedict Cumberbatch (“The Imitation Game,” “Black Mass”) as Dr. Stephen Strange, Chiwetel Ejiofor (“12 Years a Slave,” “Triple 9”) as Mordo, Rachel McAdams (“Spotlight,” “Southpaw”) as Dr. Christine Palmer, Benedict Wong (“The Martian,” “Prometheus”) as Wong, Michael Stuhlbarg (“A Serious Man,” “Steve Jobs”) as Dr. Nicodemus West, Benjamin Bratt (“Traffic,” “Piñero”) as Jonathan Pangborn, and Scott Adkins (“El Gringo,” “The Expendables 2”) as Lucian/Strong Zealot, with Mads Mikkelsen (“The Hunt,” “Casino Royale”) as Kaecilius and Academy Award winner Tilda Swinton (2007 Best Supporting Actress, “Michael Clayton”; “Julia”) as The Ancient One. 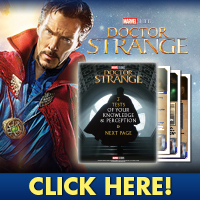 Marvel Studios Phase 3 Exclusive Look – Get an early peek at Marvel’s spectacular upcoming films, including Marvel Studios’ Guardians of the Galaxy Vol. 2, Thor: Ragnarok, Black Panther andAvengers: Infinity War.